A Style WOW! | A Savings WOW! 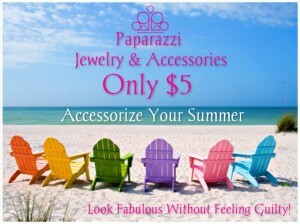 Would you like to spruce up your summer wardrobe with some fun and fashionable jewelry and accessories for only $5 each? Would you like a chance to win some prizes by playing some fun games? Join me tonight for A Style WOW!’s “Welcome to Summer” event on Facebook! When: Wednesday, June 10th at 8 pm CDT through Thursday, June 11th at 10 pm CDT. Where: Join the event on Facebook. All jewelry and accessories are no more than $5 plus tax. Our Paparazzi Accessories jewelry is also nickel and lead free! I’ll post pictures of fabulous $5 and $2 jewelry and accessories starting at 8:00 pm CDT. The first person to comment with “SOLD” under the picture of the item they want, gets to purchase that item. Most items I have is just one in stock, so act quickly to make sure it’s yours! If you live near the Naperville/Aurora/Oswego, IL area, I we can meet up for delivery (no shipping fee). If you are not local, I can ship it out to you. I became a Paparazzi Independent Consultant because my daughters and I love jewelry. Since there is also a Starlet Shimmer line, perfect for kids at a great price, they are able to get involved and are learning how to run a business, too. You can also order online at www.AStyleWOW.com! Let me know if you would like more information on how easy it is to start your own Paparazzi Accessories business!